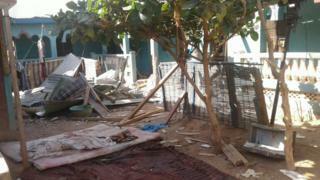 At least 12 people have been killed in an attack in Kenya claimed by Somalia-based militant Islamist group al-Shabab. The target was a guesthouse hosting members of a theatre group who were performing plays in schools in the north-eastern town of Mandera. Kenya's President Uhuru Kenyatta has called the attack "heinous". In Somalia, the militants exploded a truck bomb near an African Union military base. There has been a spate of deadly attacks targeting Christians in the mainly Muslim region around Mandera. Reports say that the 10-member theatre group was composed of university students who had travelled to the town to perform plays in local schools. Two members of the little known theatre travelling group, Pearls Quality Edutainment, were killed. The others were among among 10 people rescued after the dawn attack. Mr Kenyatta has called off an official visit to Angola "in solidarity with the victims' families", a State House statement says. He said "several Kenyans had been murdered in a terrorist attack" and called for religious tolerance, adding that "Kenyans will not be divided in religious lines". While he appeared to blame al-Shabab, Mohammud Saleh, the north-eastern regional coordinator said "local criminal gangs were behind the attack". Al-Shabab said it had carried out the attack in an affiliated radio station saying it had killed "15 Kenyans". Earlier this month, al-Shabab militants killed six people in an attack the group said was aimed at forcing Christians out of the area. Mandera borders Somalia, making it vulnerable to attacks from militants based there. Many of the Christians in the area are skilled workers from other parts of Kenya, making a vital contribution to local hospitals and schools. This was the fourth attempted attack on Pearls Quality Edutainment actors who had been in Mandera town for three weeks performing plays in secondary schools. Daud Otieno, the group's producer who survived the attack, told the BBC that the gunmen raided the hotel early on Tuesday morning, shouting "actors, actors" while firing at the rooms. Eight cast members who stayed in the hotel, which has a capacity of 20 people, survived. The actors were on their final day before the gunmen struck. "We have been receiving threats and we have experienced attacks wherever we stayed before they finally got us," said Mr Otieno. He said the gunmen spoke in Somali and fired at them repeatedly and some of them hid in the toilets as the gunmen fired at them and set off explosions. The African Union Mission in Somalia (Amisom) has said on its Twitter account that 10 attackers were involved in the attack on a base with Djiboutian troops in the central city of Beledweyne. Amisom also said that 10 attackers involved in the attack had been killed and that the situation had been brought "under control". It did not mention its own casualty figures. An al-Shabab spokesman has told the Reuters news agency that it had killed 17 Amisom troops in the attack but this has not been confirmed. Al-Shabab is affiliated to al-Qaeda and has been at war with Kenya ever since Kenyan forces entered Somalia in October 2011 in an effort to crush them. Kenyan troops are now part of the African Union mission in Somalia. The militants have lost control of most Somali towns and cities in recent years but still control rural areas in southern and central Somalia.